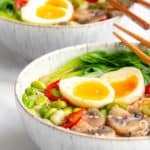 This miso ramen is so easy you won't believe it! Rainbow vegetables, tender rice noodles and a perfectly runny egg all served in a fragrant unami broth. Healthy, GF & vegan option. Bring a pan of water to the boil and carefully add the eggs to cook for 5 minutes. Drain then run under cold water to stop them cooking. Peel each egg once cool enough to touch. In a large saucepan combine the stock, miso, soy/tamari, honey/maple syrup, ginger and chilli. Bring everything to a boil then reduce the heat and simmer for 5 minutes. In another pan cook the noodles according to the package instructions until just al-dente. Remove from the heat and drain. Add the baby corn, edamame beans and mushrooms into the broth. Bring it back up to the boil, lower the heat and simmer for another 5 minutes. Then add pak choi to simmer for another minute or so until tender. Arrange the rice noodles in the bottom of 4 bowls and evenly ladle over the broth with the vegetables. Cut the soft boiled eggs in half and arrange them on top. Sprinkle over the spring onion, sesame seeds and chilli then serve immediately. Although I would recommend eating this miso ramen straight away, leftovers (excluding the egg) can be kept for up to 3 days and reheated over the stove. This recipe halves well if only feeding two. Gluten-Free: Assure your miso paste doesn't contain barley and is certified GF. Use rice noodles or other GF noodles. Use tamari rather than soy sauce. Vegan: Omit the egg and top this ramen with fried tofu or tempeh. Use maple syrup rather than honey. I personally use red miso paste when making miso ramen but you can use which ever you prefer. The darker the colour, the stronger the flavour.